In an era when new computers are introduced on a yearly cycle, it is amazing that the IBM 1800, introduced in 1964, is still in operation today. Being an early real-time computer, maybe a more impressive outcome is the number of new applications that were created on this machine. This article is supported by a collection of documents in PDF format. They are text searchable using the Adobe ‘Find’ function. The quality of some of the originals is less than perfect meaning that some text searches may not find the entire search requested. Links to these documents are shown in blue. 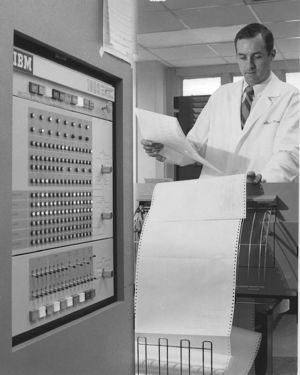 The IBM 1710 in a process control environment. Shown on the left center is the IBM 1711 box with the process input/output hardware. 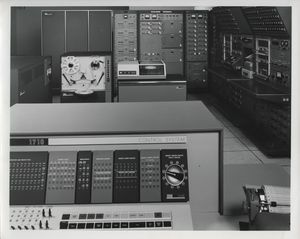 The Harrison, Landeck and St. Clair article describes IBM’s first efforts with real-time systems using the 1710 and 1720 systems that were based on the 1620 computer. IBM had little experience with process control and data acquisition, and major competitors included DEC’s PDP 1, 4 & 5, Advanced Scientific Instrument 2100, Computer Control Corp DDP24, RCA 110, SDS 910, 920 & 9300, CDC 160A, 3200, Packard Bell PB 440 & 250, Beckman 410 & 210, Sperry Rand U1218, GE 412M, GEPAC 4000, and TRW 340. They knew that to achieve penetration into a relatively unfamiliar market, they would need an excellent product, improved marketing strategy emphasizing flexibility and quick response, education, application development and reliability. On November 30, 1964, the IBM 1800 was announced. Seven 1800 DAC Centers were setup around the country where users could learn about the 1800 and test programs before their machine was delivered. The IBM 1800 Data Acquisition and Control System was designed for real-time data acquisition, analysis and control. It is modular in construction and could be individually tailored for individual users. An overall description of the system can be found in an IBM Sales Summary and the IBM 1800 System Summary. An extensive list of 1800 documents can be found in the 1800 Bibliography. A brief description with cost data and a color photograph can be found in the IBM Archives. There is nothing unique about its architecture, single accumulator, 3 index registers, and it is well described in Chapter 33 of Computer Structures by Bell and Newell, McGraw-Hill, 1971. It has a flexible process input/output front end and supports memory cycle stealing. The maximum magnetic core memory is 65,538, sixteen bit words plus parity and storage protect bits. This word by word storage protection allowed the machine to run for extended periods of time without the need for a system reboot. It has a separate memory space (aux core) so that IBM Field Engineers could run diagnostic programs while the process was being monitored. The standard peripherals are a 1442 Card reader, 1443 printer, 1816 Control console, maximum of two 2401 tape drives, maximum of three 2310 single platter disk drives, and a 1627 plotter. 2311 multiple platter disk drives were added later. It was built with the SLT technology used in the IBM System/360. See the I800 Reference Card for a quick look at instruction details, and the 1800 Configurator for how the pieces fit together. There is a large family of real-time devices and features including analog input, analog output, digital input, digital output, and 24 level priority interrupts. Input and output are transmitted under program control or high speed data channels (cycle stealing.) Most of these devices could be ordered with special conditioning to match user’s signals. A key feature of the machine was IBM’s support of machine extensions to meet the unique demands of process oriented users. These were called Request for Price Quotation or RPQ. There were over 320 RPQs which included such items as a floating point processor and a buffered System/360 selector channel. Some RPQs became popular and were given 1800 feature codes for ordering purposes. The initial operating system was called TSX for Time Shared Executive which supported process control and concurrent background program development allowing the process programs to be developed and modified while the process was being monitored and/or controlled. Later IBM introduced MPX for MultiProgramming Executive which was a major step forward in real-time system software, and most users converted to it. 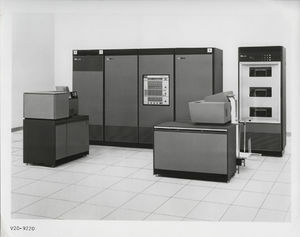 In Harrison, Landeck and St. Clair’s description, “It was the first IBM system to provide multiple fixed partitions into which programs could be scheduled on the basis of external events, time-of-day clock, time interval, operator command and the batch job control language. MPX was capable of controlling multiple independent real-time processes with batch program preparation and business and engineering applications running in the background. MPX also made significant advances in the area of error recovery needed for continuously running processes.” While it takes some time to learn how to use it, it is great tool for its users. Programming is in Assembler and FORTRAN, and PROSPRO, a fill in the table process oriented language. FORTRAN is a subset of FORTRAN IV with some additions. A unique feature of 1800 FORTRAN is the ability to pass a data structure to the operating system so that user system programs can be written in FORTRAN. Programs that normally require a professional programmer can be written by a FORTRAN trained process control person. To IPL or start the system, eight cold start punched cards are read from the 1442 card reader. The 1130 was selected as the base architecture for the 1800. The desk-sized 1130 was designed for individual use by engineers, scientists and mathematicians. It had the same instruction set less two instructions, and the assembler and compiler are the same for both machines. Many programs and subroutines written for the 1130 will run on the 1800, and that enriched the library for the 1800 user (see Catalog of 1130 and 1800 programs.) There is a least one physical 1130 running in 2011. The IBM supported users group for small computers was COMMON (Share was the large machine equivalent.) The 1800 Project was managed by John Wolfgang and later by Dale Preston, Fred Ludwick, Bernie Nordberg and David Bottles. John’s contributions were enormous. In addition to monthly contributions to the COMMON Cast newsletter, he organized training, the sharing of problems, fixes, and programs, and was always available on the HOTLINE telephone to help a user. By 1975, the 1800 was a stable machine, and attendance at annual COMMON meetings and Cast newsletter items declined (Click HERE for a sampling of 1800 postings in that newsletter.) Several committees were formed to generate user consensus to help and/or influence IBM. MPX Review. This committee of 13 people plus 3 from IBM did an extensive review of MPX from the users point of view, and generated a very large report that was submitted to IBM. There is documentation that some of the report’s recommendations were included in future MPX releases, but it was mostly in vain as IBM announced the System/7 soon thereafter. Fortran Review. This was a critical analysis of 1800 FORTRAN from a process control and data acquisition point of view. Follow-on Machine. In April 1973, it became evident that IBM had no viable plans for an upgradable replacement for the 1800. A committee was formed and charged to report the 1800 Project’s position on a follow-on process computer system. After the report was submitted, IBM noted in a letter that it was a comprehensive and perceptive report; however, another letter stated that IBM had announced new systems that addressed these issues. 1800 hardware and software support continued for several years, but not a growth path. With IBM’s decision not to build an upgradable follow-on machine, several companies entered that market. There were two strategies, a faster version for computational intensive users and an identical version for processes that required it. The fast version companies were Digital Scientific with their META 4/1800 Emulator Computer System, and the General Automation with their 18/30. The identical version company was Cable & Computer Technology with their CCT 1800 Emulator originally built for the Air Force Minuteman Missile Test Facility. Oil refining (Mobil, American Oil, Sinclair Oil, Clark Oil, Exxon), Traffic control (Wichita Falls, New York City), Manufacturing (IBM, Ford, Owens-Corning, Sylvania, Lukens Steel, Reynolds Aluminum), Testing (Air Force-Minuteman Missile, Buick, Essex Wire, Union Camp), Utilities (Pickering Nuclear, Allegheny Power, San Antonio Water Board, Public Service of Colorado), Wind Tunnel, and Other (CERN proton synchrotron, NASA, Scripts Oceanography-1800 onboard ship, India, IBM Distillation Tower). Health Science: Clinical Laboratory Automation (IBM, Varian), Patient Screening, Patient Monitoring and Control (UAB Surgery-closed loop blood and drug infusion), Electrocardiogram Analysis (Mayo Clinic, Cox Heart Institute), Research (Syntex, Blood Lab, Psychology, Basic Science). University of Alabama in Birmingham, Department of Medicine. The author (shown in the photograph) shamelessly presents a system that initially automated the Coronary Care Unit as part of a NIH research grant, and later expanded to serve research and clinical needs of the Division of Cardiology. There are several technical monographs that describe the project. The basic system, built around a well designed sub-executive that ran under MPX, was described in a paper presented at the 1970 Spring Joint Computer Conference. The 1800 played an important role in the development of real-time data acquisition and control systems. People from hundreds of organizations developed new applications for computers on the 1800 that are running today on modern computers. John Wolfgang, NASA, for sharing his library of 1800 information, for reviewing this article, and for these personal notes. Tom Harrison, IBM, for co-authoring the Harrison, Landeck and St. Clair article and for reviewing this article. IBM Archives for photographs, application notes, and other documents. 1800 users for sharing their programs, techniques and experience with me and others. 2. Thomas J. Harrison, Handbook of Industrial Control Computers, Wiley-Interscience, 1972, 1056 pages. This page was last edited on 22 July 2014, at 16:15.